Commissioned on July 1,1968, the Naval Training Center, Orlando, was established to enhance the manpower training capabilities of the United States Navy. Occupying the site of the former Orlando Air Force Base, the Navy's third training center is rapidly becoming a show place among training commands in the armed forces. The Commander, Naval Training Center, is tasked with "providing basic indoctrination for enlisted personnel, and primary, advanced, and specialized training for officer and enlisted personnel of the Regular Navy and the Navy Reserve." 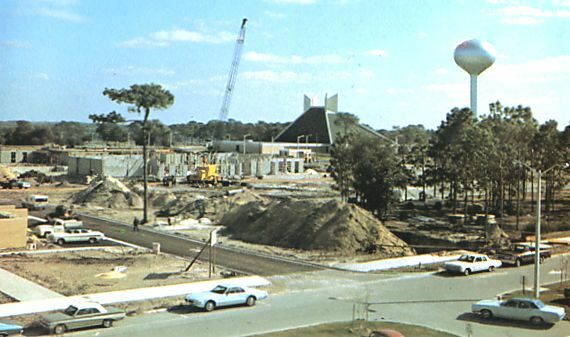 A decision was made in the nation's capital to develop a third Naval Training Center, and on December 6, 1966, the Honorable Robert H. B. Baldwin, then Under Secretary of the Navy, announced that the city of Orlando had been chosen as the site of the Navy's newest and most modern training facility. Orlando was selected because of its year-round climate, availability of transportation, sufficient family housing, and availability of the Orlando Air Force Base under the Department of Defense Base Closure Program. The newly constructed Recruit Training Command features modern and functional buildings and presents a campus-like atmosphere. Commissioned with the Naval Training Center, the Recruit Training Command provides a smooth transition from civilian life for enlistees into the naval service. Additionally, the Naval Training Center is host command for the Naval Training Device Center, which is responsible for the research, development, production,' maintenance, and modification of air, sea, subsurface, land, and space trainers applicable to all types of military situations. Another tenant command of the Naval Training Center is the Naval Hospital, Orlando, currently a 200-bed facility. The Hospital's combined medical and dental staff of over 400 supports the Naval Training Center and other military installations in the Central Florida region, as well as dependents and retirees. A modern "high rise" replacement hospital is planned for the future, and this facility will provide the most modern and complete medical care to the ever-increasing active duty and retired military population of the Central Florida area. On November 1, 1969, the Service School Command was established. It initially comprises two schools, the Naval Advanced Undersea Weapons School (AUWS) and the Personnelman Class "A" School. The AUWS is housed in a new brick structure, located on 6, 100 square feet of real estate, and encompasses 109,000 square feet of classrooms, laboratories and an auditorium. The PN "A" School is housed in the old Air Force Photo Squadron Building on the southwest shore of Lake Baldwin. Another tenant unit is the Navy Finance Office, Orlando, which prior to the commissioning of the Naval Training Center, was a branch of the main office at Jacksonville, Florida. The Orlando Finance Office is responsible for disbursing support to 17 military activities in the Central Florida region, and renders civilian disbursing services to six organizations. Additionally, the Center hosts the Navy Printing and Publications Service Branch Office, the Defense Contract Administration Services District, and the Resident Officer-in-Charge of Construction. Presently, the Recruit Training Command has an average on-board load of about 3600 recruits occupying its five modern barracks, each of which houses 12 recruit companies. These five barracks, plus a 4,600-man mess hall, a classroom building, a recruit chapel, a training ship mock-up, and other facilities comprise the first camp of the Recruit Training Command. The second recruit camp will be identical to the first with five barracks and additional support buildings for training purposes. Construction on the second camp began in Fiscal Year 1969, with targeted completion date in mid-1973. The recruit population will then exceed 8,000. The two camps will be interconnected by a "central core," consisting of two 26-classroom training buildings connected by the Television Building, which houses the closed-circuit television system. Television provides a basic supplement to the academic instruction in recruit training. The below stories appeared on the Navy Wire Service in 1994 and 1998. -USN- NNS822. Last Recruits Graduate from Orlando Boot Camp ORLANDO, Fla. (NNS) -- More than a quarter century of tradition at Recruit Training Command (RTC) Orlando, Fla., came to a close Dec. 2, with the graduation of the command's final six companies of recruits. Basic training for all recruits will now be held at Recruit Training Command, Great Lakes, Ill. Chief of Naval Operations ADM Mike Boorda served as reviewing officer for the 1,321st and final pass in review ceremony. The CNO praised Orlando for playing host to more than 650,000 recruits. The city will not be forgotten, said ADM Boorda, because so many Sailors will always think of Orlando as the place where their life in the Navy began. Recruit Training Command Orlando will close officially March 31, 1995. NNS5508. NTC Orlando ends 30 years of naval service. by JO2 Paul Gleason, NTC Orlando Public Affairs ORLANDO, Fla.
(NNS) -- Naval Training Center (NTC) Orlando, Fla., ended 30 years of service to the Navy Dec. 18 when the base disestablished during ceremonies at the command. The base became the Naval Training Center and Recruit Training Command (RTC) July 1, 1968, after 28 years as an Army Air Corps and Air Force facility. Just one year after the establishment of the Naval Training Center, Service School Command (SSC) Orlando was established. The command initially provided training for two ratings: Personnelman (PN) and Yeoman (YN). These two schools relocated, however, and SSC later provided training for four other ratings: Torpedoman's Mate (TM), Quartermaster (QM), Signalman (SM) and Electronics Technician (ET). In 1973, Orlando became the sole site of recruit training for enlisted women. Prior to this, women had been trained at Bainbridge, Md. The move to Orlando created the first co-located training site for enlisted men and women. In the mid-seventies, the Nuclear Power School relocated to Orlando from locations in California and Maryland. The school trained officers and enlisted Sailors in nuclear propulsion after formal training elsewhere. The Nuclear Field "A" School formed in 1985 provided fundamental nuclear training and formal rate training for Machinist's Mate (MM), Electronics Technician (ET), and Electrician's Mate (EM). In 1981, a modern high-rise hospital replaced the former Navy hospital to provide complete medical care to the growing active-duty and retired military population in central Florida. Navy Hospital Orlando closed June 2, 1995, and has since been converted into a Veterans Administration Outpatient Clinic. February 1992 marked another historic undertaking as RTC Orlando organized its first co-ed or mixed-gender recruit companies. The pilot program included nearly 900 recruits. A year later, NTC Orlando and many other military installations across the country were ordered to close by the 1993 Base Realignment and Closure (BRAC)Commission. Recruit Training Command graduated its last company of 459 recruits in the 1321st Pass-In-Review Ceremony Dec. 2, 1994. The command closed officially March 31, 1995.